The diagnosis of psoriasis is usually clinical which means that the doctors would diagnose psoriasis after a careful examination of the skin. The white silvery scales of psoriasis are very distinctive and guiding feature for diagnosis. Also, consideration of the history, family history, the spread on affected areas, etc. is taken into account to conclude the diagnosis of psoriasis. In cases of doubt, the doctor may ask the patient to do skin biopsy that means examining a small skin sample under a microscope. However, this is not a routine practice. When psoriasis affects the scalp, it may resemble a few conditions such as a. Dandruff. 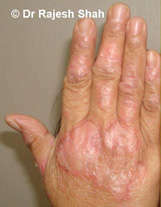 b. Seborrhoeic dermatitis c. Eczema d. Lichen Planus. Diagnosis in terms of causative factors and triggers is also done through thorough case taking. A well-studied case in terms of diagnosis of the cause of psoriasis, such as stress triggers, etc. would be beneficial while deciding the line of action. Just to make a diagnosis of Psoriasis is not enough. Clinically trained eyes can make the diagnosis in minutes. What is more important is to understand and evaluate the origin, probable cause/s, genetic tendency, family history of certain diseases, the course of the disease, its spread, the affection of joints, study of previous medications consumed by the patients, etc. The actual diagnosis of Psoriasis should entail in-depth study and behavior of psoriasis over the long period, response to the treatment, etc.